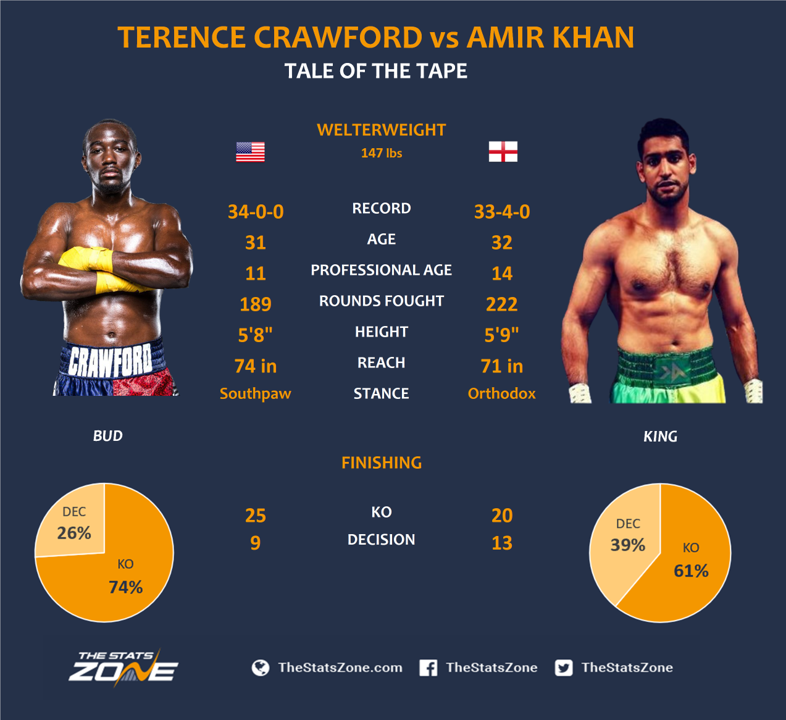 Are tickets still available for Terence Crawford vs Amir Khan? Amir Khan has opted in favour of a bout with one of the best Boxers in the world, Terence Crawford, putting off the much-anticipated fight with fellow Brit Kell Brook. That fight is destined to happen, but for now Khan is eyeing up the WBO welterweight title and the chance to take one of the biggest scalps in the sport at the mecca of Boxing, Madison Square Garden. 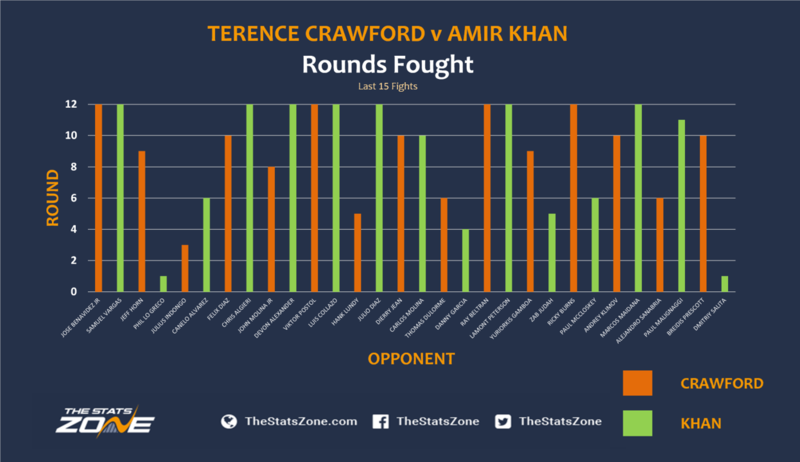 On paper, Crawford and Khan match up very similarly. They are virtually the same age with similar experience and dimensions. 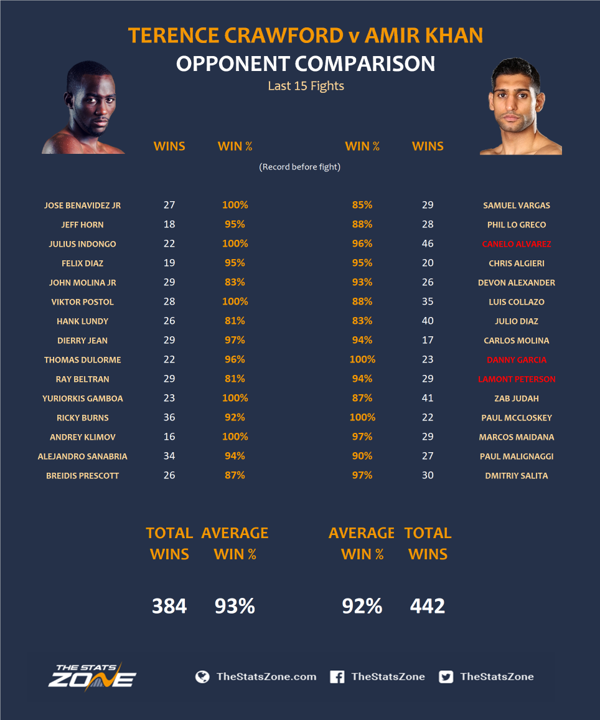 The main difference of the tape and what separates Crawford is the four losses on Khan’s record. He is a former champion with big wins under his belt but he has lost the big fights in memorable fashion whereas Crawford is unbeaten, continues to improve, and has stepped up on the big stage by putting away contender after contender. In the last six years, Crawford has earned: the WBO lightweight, NABO lightweight, The Ring & lineal lightweight, WBO light welterweight, WBC lightweight welterweight, The Ring & lineal light welterweight, WBA light welterweight, IBF light welterweight and WBO welterweight titles. He is not just beating the best guys in these divisions, he is finishing them. Khan on the other hand, has won seven of his last 10 and only finished two of them. These fights are spread out over the last seven years but six were hard-fought decisions and two of them were devastating knockout losses at the hands of Canelo Alvarez and Danny Garcia. So, Crawford arrives to MSG in the form of his life and full of confidence. Khan also arrives with the confidence of a blistering first round knockout over Phil Lo Greco and a well-earned decision over Samuel Vargas, but has more miles on the clock with some high-profile losses and will be the underdog. As you can see, Khan has been in the ring with the same calibre of fighter. His opponents have had more experience going into their fights and despite all of Crawford’s title fights, their opponents have had virtually the same records on average, which is an extremely high win percentage. However, the difference is all in Khan's losses. He has failed to deliver in the big fights and more worryingly he has shown a susceptibility to knock-outs. Including his fight against Breidis Prescott back in 2008, Khan has been knocked out three times, which is why many will back the heavy-hitting Crawford for a 26th career knockout. How likely is a Crawford knockout and when can we expect it? Khan's defeats by knock-out have come typically early in the fight. His aggression has left him open to getting caught but he vows not to make any similar mistakes in this fight. However, Crawford has an exceptional finishing rate and his cardio makes him equally dangerous in every round. 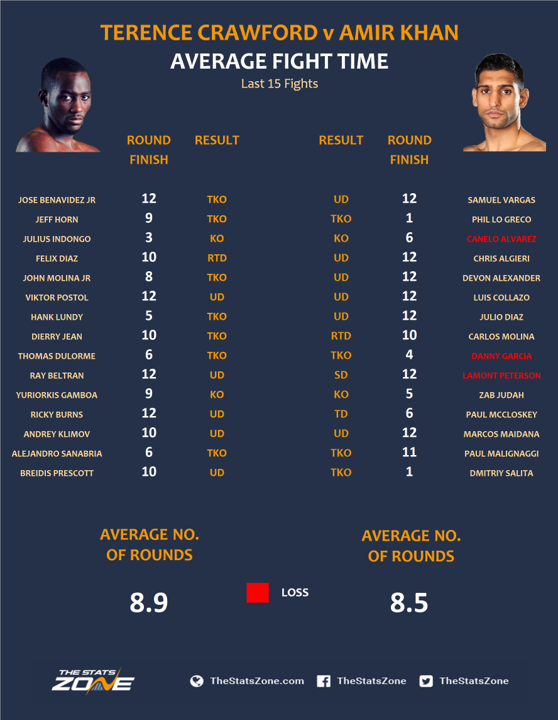 As you can see, their average fight time in the last 15 fights is virtually identical. If the fight gets past eight rounds, you have to favour Crawford. He has too much class to get outpointed which makes a decision for Khan unlikely. That said, Khan is not out of this fight, he has the speed and technique to give Crawford problems but you feel it has to be a mistake from the American, and a shock knockout from Khan, to cause the upset. 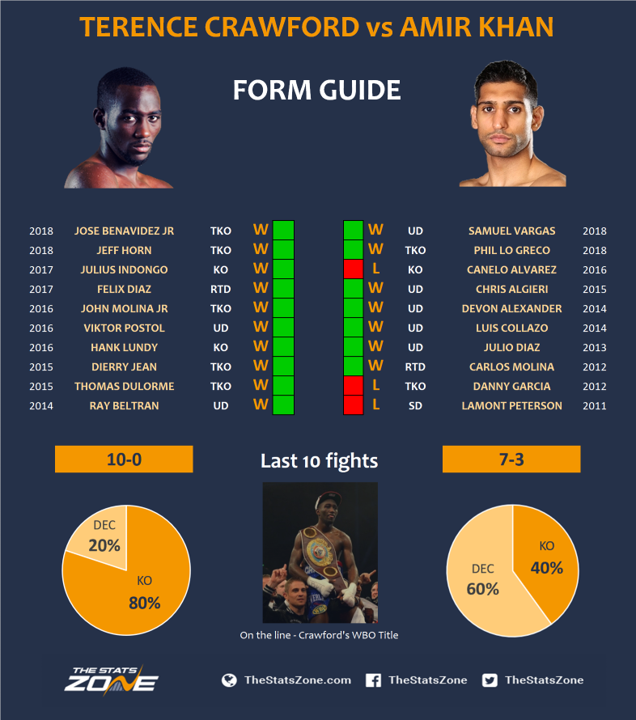 Many predict an easy win for Crawford before setting up a bigger fight but there is a lot of pressure on both men. Crawford is desperate for the tag of ‘the best pound-for-pound fighter in the world’ so he will feel he not only has to win but win convincingly. As for Khan, he knows another loss at this stage of his career will close more doors to a title, and will be mindful of being reckless to avoid another knockout blow. Khan has looked great in his last couple outings and is back with his former trainer Virgil Hunter, so expect one of the best versions of Khan we have seen in recent years. However, even the best Khan may not be enough for the unbeaten, multi-division champion who will keep testing the suspect chin of Khan until it gives way in the later rounds.